Image courtesy of Mactac. Mactac’s medical adhesive solutions are designed for direct skin contact, are latex free, and are stable after exposure to gamma or EtO sterilization. In addition to caring for the sick, today’s medical providers are also heavily focused on prevention, patient education, and health and wellness strategies. As part of this newer approach to healthcare, providers are implementing ways to deliver additional care options that are both easily accessible and more affordable. Of these, one of the fastest growing and most widely adopted is wearable medical technologies. Wearable medical technologies not only provide support for care related to acute and chronic medical conditions, but also for disease prevention and lifestyle choices. They can monitor health, remind patients to take medications, and perform other health-related tasks. According to eMarketer, the number of U.S. adults that used a wearable medical device in 2015 was 39.5 million, nearly 58 percent more than in 2014. eMarketer says that number will skyrocket to more than 81 million Americans by 2018. Similarly, Global Industry Analysts Inc. predicts the global market for wearable medical devices will reach $4.5 billion by 2020. While the wearable medical technology market is vast—from watches or armbands that monitor fitness activity to specialized gloves that help with mobility and running shoes that reduce potential injury—a significant sector of the market is dedicated to solutions that require adhesion to a user’s skin. 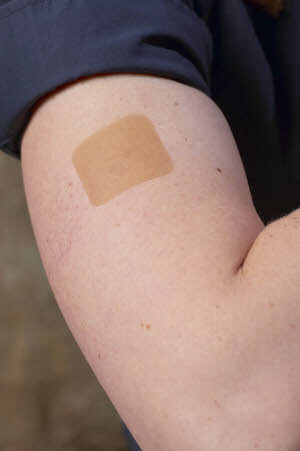 For example, flexible patches that can track user temperature over time is a trending technology. These continuous-temperature, remote-monitoring devices are often used for babies and young children, post-operative patients, cancer patients, and elderly patients. They are typically placed near the user’s armpit, and providers are notified of temperature changes, such as fevers, by way of mobile alerts. Heart-monitoring devices that record a user’s heart rate and rhythm (electrocardiogram activity) for a certain timeframe, generally 24 to 48 hours. Glucose-monitoring devices that are designed as continuous insulin delivery systems, checking and monitoring a user’s blood-glucose levels around-the-clock. TENS (transcutaneous electrical nerve stimulation) electrode therapy devices that use low-voltage electrical current for muscle pain management and relief. Eliminating the need for bands or other bulky or uncomfortable components to properly affix the technology. Making the technology lighter in overall weight and more convenient and easy to use. Improving data accuracy as the technology is more precisely kept in place. However, as with all direct-skin applications, the type of adhesive used for these four wearable technology trends (continuous-temperature remote monitoring, heart monitoring, glucose monitoring, and TENS electrodes devices) is imperative to success. Above image courtesy of Mactac. Many rubber and acrylic polypropylene and polyethylene foam adhesives are formulated for sustained, low-irritability skin contact and have been assessed per ISO 10993 guidelines for skin-contact properties. For example, Mactac offers cross-linked polyethylene foam solutions that meet these guidelines. Above all else, chosen adhesives need to meet two primary goals: functionality and user experience. Without question, adhesives should perform as intended and adhere well per the requirements of the technology while also delivering an easy, pain-free, and comfortable user experience. Generally speaking, medical-grade adhesives offer varying levels of adhesion—from low or soft to high or extra strength. With today’s adhesive advancements, these adhesion levels can be achieved with both acrylic and rubber adhesives. However, acrylic and rubber adhesives certainly aren’t interchangeable as each offers different performance attributes. Rubber adhesives are ideal for short-term wearable applications, such as one day or less. They are also typically more cost-effective than acrylic adhesives and are more aggressive for multiple skin types. Acrylic adhesives are best for longer-wear applications (multiple days at a time) and are often much more breathable and stretchable than rubber adhesives. Newer medical-grade acrylics also feature quicker cure times, higher initial tack and high-shear strength, which allows them to better resist harsh environments and maintain adhesion after exposure to water or other fluids. What is the intended length of wear? What is the technology’s most common user skin-type? What environmental conditions does the technology need to withstand? What is the typical activity level of the technology’s user? What is the overall weight of the technology and what is the size of the skin contact area? Above image courtesy of Mactac. Mactac’s single-coated non-woven tapes are available in various sizes and weights and are known for their high MVTR and high adhesion properties. From this information, design engineers, converters and device manufacturers can identify adhesive characteristics required, such as breathability, conformability, thickness, strength, skin compatibility, latex-free and hypoallergenic properties, moisture vapor transmission rates (MVTR), fluid barrier abilities, and removability. They can then determine whether the adhesive should be rubber or acrylic as well as the proper adhesive carrier—another highly important component of adhesive construction in direct-skin applications. Carriers can be free films or transfer tapes or single- or double-coated films, foams, non-woven fabrics, or elastic fabrics. The following offers recommendations on adhesive carriers that are most ideal for today’s trending direct-skin wearable medical technologies. Continuous-temperature remote monitoring patches. Since continuous-temperature flexible patches are most often used on patients with delicate skin who require comfort and superior wearability, acrylic polypropylene or polyethylene foams are great choices for this trending application. Foams, while they aren’t breathable, are known for softness and conformability, delivering a more comfortable user experience than other carriers, such as films. Additionally, foam tapes enhance application stability and offer exceptionally clean, pain-free adhesive removability. Acrylic non-woven adhesives are also another great option for flexible patch technologies. Non-woven adhesives often pair well with the needs of the technology because they can be used for longer periods of time and are extremely soft and comfortable, as well as water-resistant. Heart-monitoring devices. With heart-monitoring device technologies, electrodes are applied and re-applied to the skin often, making films ideal for these applications. Many gentle, skin-friendly acrylic films can handle re-application extremely well. Acrylic foams are also an ideal choice for heart-monitoring devices. 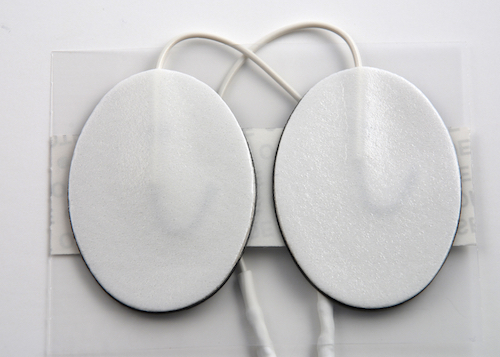 Although heart-monitoring devices are often composed of difficult-to-adhere-to low-surface energy (LSE) substrates, there are several newer medical-grade acrylic foam adhesives on the market today that adhere extremely well to these materials. These innovative adhesives are soft enough to flow onto challenging substrates, but hard enough to resist flow with applied stress so they can be applied and removed from skin without developing an adhesive bond that is too strong. Glucose-monitoring devices. Like with heart-monitoring devices, films and foams are also recommended for glucose monitoring devices. With glucose monitoring, a high-tack, soft acrylic film or foam that can hold the adhesive comfortably in place for several days – as many as 14 days in some cases – are optimal solutions. TENS electrodes devices. As TENS electrodes applications are designed to be shorter-wear and the adhesive is removed often, non-woven adhesives are generally the best choice for this application. Today, many lightweight non-woven rubber adhesives, such as non-woven polyesters, feature lower adhesion levels, which offer greater flexibility and range of motion for the user. These adhesives help ensure TENS electrodes will stay in place yet easily move with the skin, deliver necessary breathability, and remove cleanly and painlessly. Foam tapes are also an ideal adhesive option for TENS electrodes applications. As converters, design engineers, and manufacturers continue to develop and produce direct-skin wearable medical technologies, such as today’s trending continuous-temperature remote monitoring devices, heart monitoring devices, glucose monitoring devices, and TENS electrode therapy devices, adhesives will continue to play a key role in finished products. For ultimate success, adhesives should be customized specifically for each technology to meet performance and function needs and deliver users an easy, pain-free and comfortable experience. Mactac will be exhibiting at MD&M West 2018 Booth #1561 February 6-8 in Anaheim. Janet Page serves as marketing manager, performance adhesives group, for Mactac.